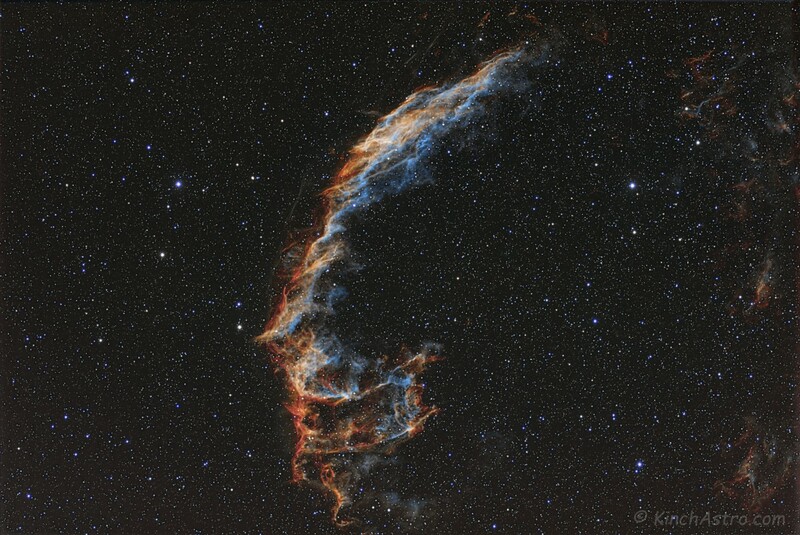 The Eastern Veil (also known as Caldwell 33), The brightest areas are NGC 6992, trailing off farther south into NGC 6995 (together with NGC 6992 also known as "Network Nebula") and IC 1340. The nebula was discovered on 1784 September 5 by William Herschel. He described the western end of the nebula as "Extended; passes thro' 52 Cygni... near 2 degree in length", and described the eastern end as "Branching nebulosity... The following part divides into several streams uniting again towards the south." When finely resolved, some parts of the image appear to be rope-like filaments. The standard explanation is that the shock waves are so thin, less than one part in 50,000 of the radius, that the shell is visible only when viewed exactly edge-on, giving the shell the appearance of a filament. Undulations in the surface of the shell lead to multiple filamentary images, which appear to be intertwined. Even though the nebula has a relatively bright integrated magnitude of 7, it is spread over so large an area that the surface brightness is quite low, so the nebula is notorious among astronomers as being difficult to see. 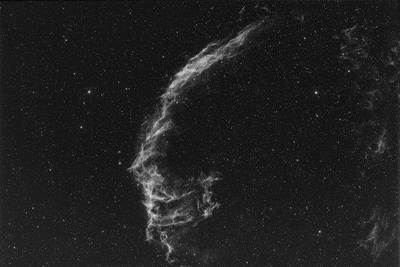 However, an observer can see the nebula clearly in a telescope using an OIII filter (a filter isolating the wavelength of light from doubly ionized oxygen), as almost all light from this nebula is emitted at this wavelength. An 8-inch (200 mm) telescope equipped with an OIII filter shows the delicate lacework apparent in photographs, and with an OIII filter almost any telescope could conceivably see this nebula. Some argue that it can be seen without any optical aid except an OIII filter held up to the eye. 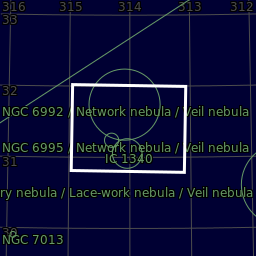 The brighter segments of the nebula have the New General Catalogue designations NGC 6960, 6974, 6979, 6992, and 6995. 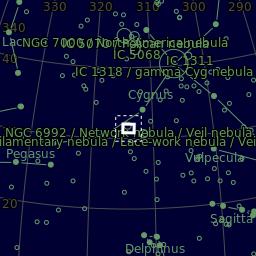 The easiest segment to find is 6960, which runs behind the naked eye star 52 Cygni. NGC 6992/5 are also relatively easy objects on the eastern side of the loop. NGC 6974 and NGC 6979 are visible as knots in an area of nebulosity along the northern rim. Pickering's Triangle is much fainter, and has no NGC number (though 6979 is occasionally used to refer to it). It was discovered photographically in 1904 by Williamina Fleming (after the New General Catalogue was published), but credit went to Edward Charles Pickering, the director of her observatory, as was the custom of the day. Something different: This is an OHS = RGB rendition of the image. This is why Narrowband Images are sometimes referred to as False Colour images. The emission lines can be mapped to suit - either to bring out certain features better or to appear more pleasing to the eye. The topmost image is in Hubble Palette....the normal rendition (if there is such a thing) that we are used to. Any comments on the 'unusual' OHS rendition are most welcome via the last page on this site - my guess is that you will either love it or hate it. Generally I am not one for too much colour in 'astro' images - but I actually like this.